The largest yacht ever built at Oceanco features an exterior profile created by Lobanov Design, and an interior by Sorgiovanni Designs. Displacing more than 4,500 gross tonnes, with 16.4m/54ft beam, according to Oceanco, this superyacht maintains a very noble and original profile from bow to stern. 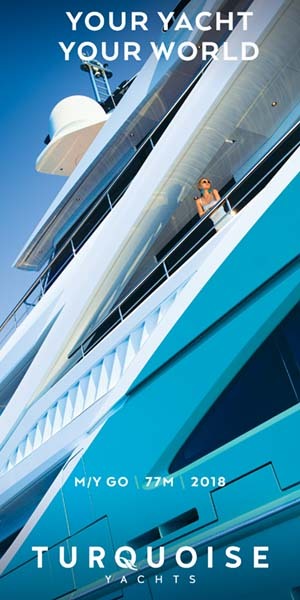 The yacht features horizontal blue lines making Jubilee truly distinctive from all other yachts. The yacht features helicopter operating deck forward with a concealed mooring deck below, as well as a large pool deck with built in Aquarium and substantial beach club below. The interior, designed by Sam Sorgiovann, is both spacious and rich, offering accommodation for up to 30 guests in 15 staterooms.